After flying up from Sydney, I unexpectedly ended up staying in Cairns for two weeks planning the next leg of my trip. 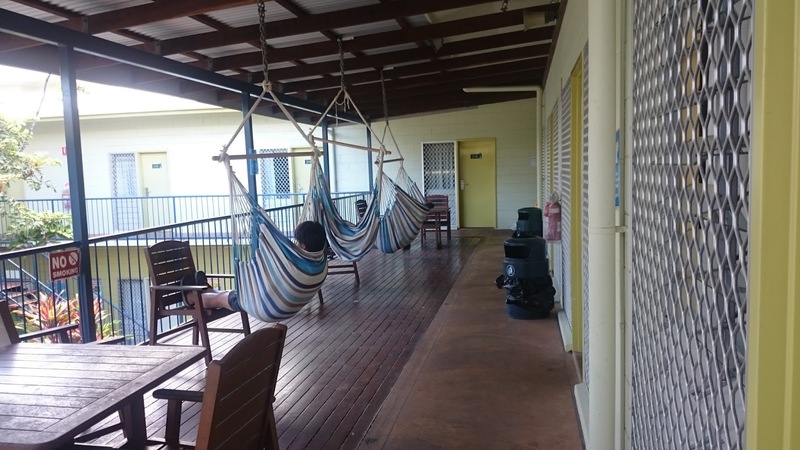 I was lucky enough (given the busy time of year) to be able to stay at the Cairns Central YHA for the entirety of that time. After a bad hostel experience back in the city, this place felt like luxury! I was more than excited to begin my stay. The room I stayed in was a basic, six-bed dorm with bunk beds and lockers (free to those with their own padlocks). It was quite spacious and had a nice balcony view overlooking the pool. The things I really liked about this YHA was the relaxed vibe and the facilities available during my stay. Guests could hang out in hammocks on the balcony, eat their meals on the tables beside the kitchen or relax on the sofas outside reception. The reception area and staff had a great number of leaflets and helpful information on local trips and excursions. Almost all were bookable through the hostel itself with daily pick-ups going from right outside the door. There was a free pancake breakfast offered to all guests between 7am-9am daily. This was great when I was actually up that early! The shared kitchen area was impressive to say the least. It was clean with ample amounts of space for preparation, cleaning and cooking. It also had plenty of fridge and dry storage areas. The pool area sat in the centre of the hostel and included sun loungers, a jacuzzi and a large swimming pool. This was great when I didn’t want to venture far in the midday sun and needed to cool down. It was also a central space to meet and talk to new people during the day. Hold on! What about the WIFI? Don’t panic! There was free Wifi offered in the reception area only (hooray!). And if you wanted to use the internet in your room, there were vouchers available to buy. The location of this hostel is another added bonus. The main shopping centre is, quite literally, across the road. Plus it’s only a 10 minute drive from Cairns airport and a 15 minute walk away from the bustling bars and esplanade. This hostel does NOT have a heavy luggage-friendly layout. I had to lift my 50L bag up to reception, down through the WIFI area and then up to my room on the second floor. This could get quite annoying when my arms and shoulders were already aching! The room I was placed in was right next to the ladies bathroom so it could get quite noisy, especially during the night and first thing in the morning. My biggest complaint was that my room had serious air-conditioning issues! It was on for a few hours then it would break unexpectedly. It was like playing temperature roulette, I never knew what I’d get when I came back in! For those who have never visited, air conditioning in Cairns during the summer is a MUST. Last but not least, the bed I had was comfortable and clean however the bottom sheet didn’t fit around the mattress so it became easily creased and tangled during the night. One of my biggest pet hates! 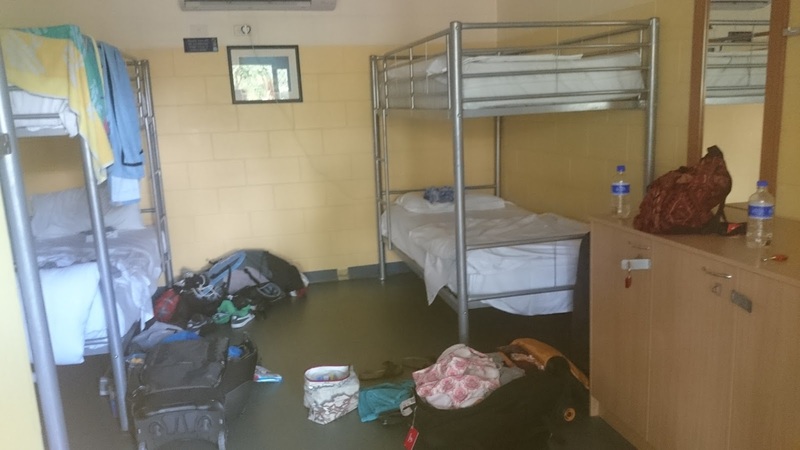 Cairns Central YHA is a great place to stay for backpackers who appreciate their sleep and aren’t mad party animals. Night managers ensured that noise levels were kept to a minimum in the communal areas after 10:30pm so this isn’t the hostel for late night drinkers/party goers. The kitchen and pool areas were shut at around 10pm so, unfortunately, no late night snacks or swims either! However, with Cairns being fairly small, the other party hostels/main nightclub are only a 5-10 minute walk away. It is relatively cheap considering the high standard and helpful location. There’s an extra bonus for YHA members as they receive a 10% discount on room rates. It is clean, well managed and has a friendly atmosphere that backpackers and families can enjoy. Yes, I would definitely stay at this hostel again. I felt comfortable and happy with the facilities and service I received. However if I wanted to be around more young people (and a lot more alcohol), I would consider staying at the other hostels in the area. Have a look on the YHA website before you book and see what you think! Room rates can vary depending on dates/availability. I paid for my first week via a fixed price deal that required a minimum of seven nights stay and my second week was variable in price. Have you stayed at this hostel? What did you think? Any comments/questions welcome!